Author: Barnes, Linda Set In . . .
Michael Spraggue receives an anonymous note requesting a meeting on the running path in the Chestnut Hill Reservoir—a favorite spot for runners training for the Boston Marathon. His muscles aching, Michael is about to throw in the towel when he sees a familiar grin. Brian Donagher is the charismatic junior senator who took Washington by storm and is now running for re-election. With him is bodyguard Pete Collatos, an ex-cop who knows Michael from his PI days. Brian has been getting death threats, and Pete wants help tracking down whoever is sending them. Michael isn’t convinced that the threats are serious—until gunfire erupts from the hill above them. Miraculously, no one is hurt, but Michael knows they won’t be so lucky next time because politics can get dirty in Boston. As the marathon approaches, Michael will have to sprint to keep a popular politician—and himself—alive. 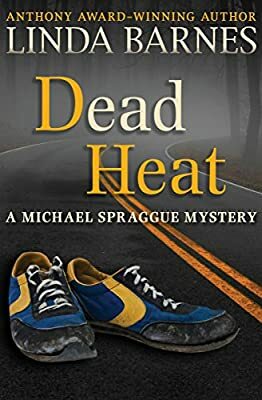 Dead Heat is the 3rd book in the Michael Spraggue Mysteries, but you may enjoy reading the series in any order.